It doesn’t *have* to take a near-death experience to change how you lead. Jeffrey Pfeffer, Thomas D. Dee II Professor of Organizational Behavior at the Graduate School of Business, Stanford University, where I have taught since 1979. Of course there are exceptions, albeit not enough of them. Some companies demonstrate that it is both possible and profitable to care for people’s physical and mental health and overall well­being. In 2004, Mark Bertolini, currently the CEO of health insurance company Aetna, suffered a severe skiing accident that almost killed him and left his left arm in constant agonizing pain. That, plus a son dealing with a rare cancer, caused him to get more interested in health as well as in alternative therapies. Aetna has made employee health a priority, with a focus on physical, mental, social, and finan­cial health. In 2015, Aetna increased its internal minimum wage to sixteen dollars per hour, which was a 33 percent increase for the com­pany’s lowest paid employees. About 5,700 people saw their wages increase. The company also changed its health benefits to reduce em­ployees’ out­ of­ pocket expenses. The company offers free yoga and meditation classes that about one ­quarter of the workforce has partic­ipated in. People who have taken at least one class “report, on average, a 28 percent reduction in their stress levels, a 20 percent improvement in sleep quality, and a 19 percent reduction in pain. They also become more effective on the job.” The company also offers a weight loss program and health screenings for its employees. In 2016, Aetna launched a student loan repayment program under which it will make matching loan payment contributions up to $2,000 per year. At Aetna, health­care costs have either gone down or, some years, gone up less than the national average—possibly because of the company’s focus on employee well­being. Bob Chapman is the CEO of Barry­ Wehmiller, a $2.5 billion man­ufacturing company with about twelve thousand people working in plants all over the world. One day a number of years ago, Chapman had an insight that he explained to me: “We became aware that all twelve thousand people who work for us are somebody’s precious child, and we know that the way we treat them will have a material impact on their life.” Chapman decided that the goal of the company should be to send people home fulfilled at the end of the work­ day. When the company began seeing employees not as objects but as people who are precious to others, they built a culture in which people cared for one another. One consequence: a much higher level of altruism “where people genuinely offered to do things for others without expecting anything in return.” The company has been quite financially successful, with a compound growth rate in earnings of about 16 percent per year, even though it operates in very difficult manufacturing industry segments. In this book, we will meet some of the companies that do care about their people’s well­being, and we will also review numerous research studies (and books) that speak to the economic and social rationales for taking care of employees. It is possible to do well and to do good at the same time. But the data on work stress, employee health, and employee engagement suggest that many more company leaders need to get—and heed—the message. 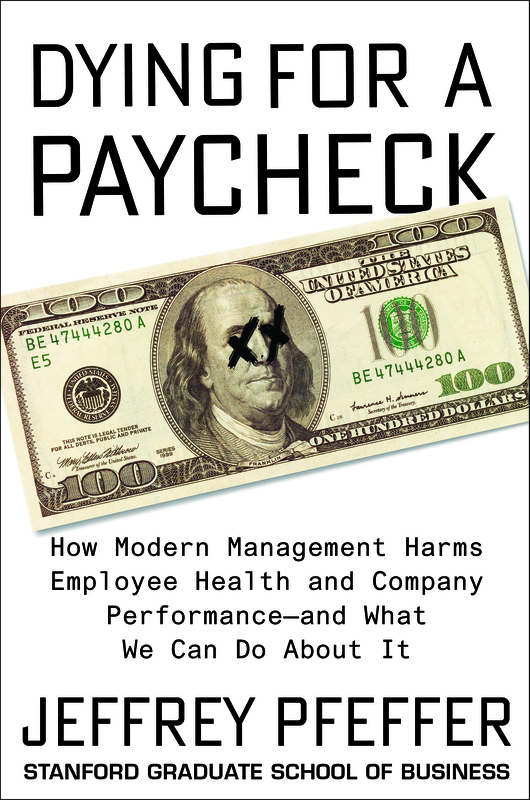 From the book Dying for a Paycheck: How Modern Management Harms Employee Health and Company Performance—and What We Can Do About It by Jeffrey Pfeffer. Copyright © 2018 by Jeffrey Pfeffer. Published on March 20, 2018 by HarperBusiness, an imprint of HarperCollins Publishers. Reprinted by permission. I have taught at Stanford's business school, U. of California, Berkeley, and U. of Illinois. Have written 15 books, the most recent, Dying for a Paycheck, scheduled to be published in 2018, and have taught seminars in 39 countries around the world. I have served on the boards of several human capital software companies as well as other public and private company boards and the board of the San Francisco Playhouse as well. My research interests are in power and influence, human resource management, the knowing-doing gap, evidence-based management, and the effects of workplaces on people's health.